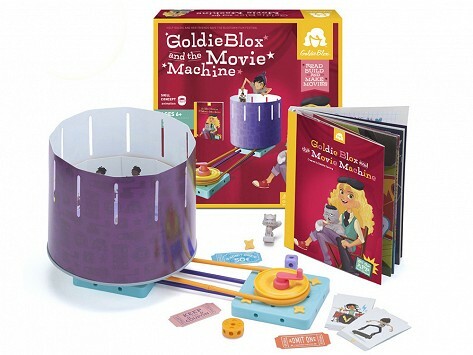 Teach kids how to make their own movies with this GoldieBlox story and construction kit. Goldie and her gang of friends team up to invent a solution and save the Bloxtown Film Festival from being canceled. Kids learn how to build a zoetrope, a pre-cinema animation device, while learning about illustration and animation. Dimensions: 11" x 11" x 2.28"
Love these! I have now purchased 4 sets for my granddaughter. She really loves craft items and this another extension for her creativity. Meet Goldie, a girl inventor who’s smart, curious, and loves to build things. In her first adventure, Goldie makes a spinning machine to help her dog, Nacho, chase his tail. Young readers can follow along with the book and construct their own spinning machine, just like Goldie. What they’re really building is a belt drive, which is a mechanical system that uses belts as a source of motion to transmit power. But “spinning machine” sounds a lot less intimidating and more relatable to kids, which is just what creator Debbie Sterling had in mind when she created this line of construction toys and books to encourage STEM learning. Debbie, an engineer from Stanford University, left a comfortable job to pursue her dream of getting young girls to love engineering and science as much as she does. She created GoldieBlox, which is both a book and a construction toy, to empower kids to solve problems by building simple machines. 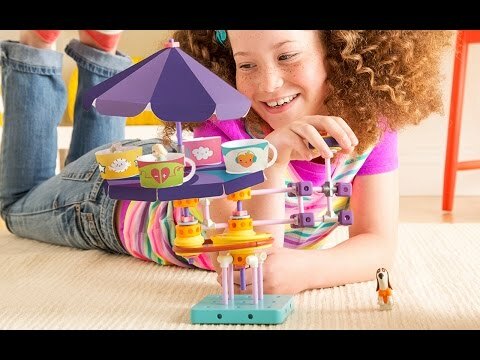 The GoldieBlox set is fun and entertaining, yet it’s also improving kids’ spatial skills and teaching basic engineering principles. GoldieBlox is girly—the colors and themes are clearly targeted at girls. But it avoids the stereotypical traps of some other girl-oriented toys. Goldie is a problem solver, not someone who passively waits to be rescued. She’s confident, ambitious and persevering. The gender ratio in engineering is significantly skewed toward men (as high as 89%). By introducing girls to a female engineer role model, Debbie hopes to change that, one future engineer at a time. Like the spinning machine Goldie builds, the wheels are in motion.